The Revive Resource rooms have been seriously depleted in regard to food for children. Can you help? Below are the items which are needed. Thank you! Items can be dropped off in the Resource Room bin in the Reveal lobby. ​Thank you for supporting our community. ALL ABOARD!!!! New schools, that is…..
Revive has expanded its Resource Room program from seven Title 1 schools in the Dysart school system into a title 1 school in Peoria! 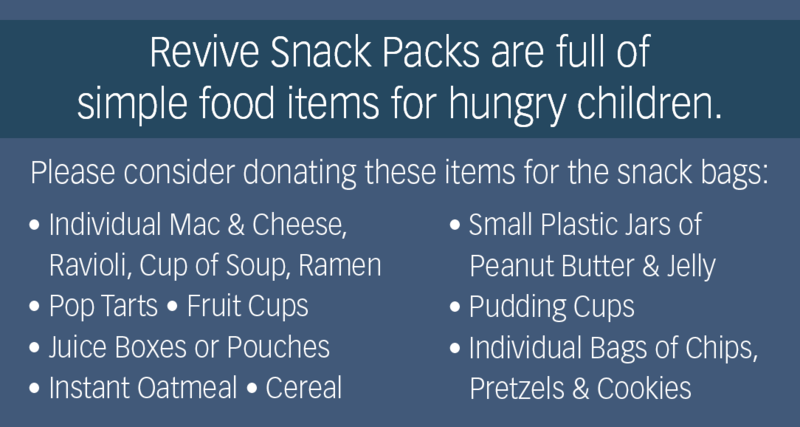 Revive will be providing essential items to the students of Peoria Elementary such as school supplies, new clothes and shoes, food packs for weekends and school breaks. These items will help students prepare for success at school! According to “America’s Promise Alliance” (March 30, 2017) one of the major barriers to success in school is “economic hardship”. By helping to provide much needed school supplies, clothing and easy-to-make meals, we are helping students overcome this major adversity. Welcome aboard, Peoria Elementary! India Update – This past year, Revive added the 1st grade to the school offered to at-risk students in India. Revive started with Kindergarten over a year ago, and this past year added 1st grade to continue the education of those kinders who moved up. It is our hope to continue adding a grade each year as students progress. Overall, 110 children take part in school and various classes offered at the community center. In addition, classes have been offered for women at the community center. Classes offered include computer skills and English classes. These classes assist the women with being able to better support their families. Revive’s responsibility in all of this? We are able to fund the building and salary for instructors. What a HUGE impact Revive is able to have internationally! Revive in the schools? It’s not just local anymore! In December, Revive launches it’s next school project…in Delhi, India! In India, children are entitled to a free education IF they can pass the entrance test. The entrance test is comprised of various preschool skills. The problem is, in slum areas parents aren’t always educated enough to teach their children these skills, or, their children are already working (ie. begging) to help support the family. Yes, 5 year olds. Begging. Let that sink in. Once a child does not pass the admission test, they are not able to retake it, and thus, their education is halted, virtually, forever; continuing the cycle of their parents, and often their parents before them. Revive is helping to interrupt that cycle. In partnership with Aradhna Vineyard church, Revive is working to open it’s first sponsored school. It will begin with Kindergarten this year, and next year will offer First Grade as well as Kindergarten. The addition of grades will continue each year, until the school is complete with all grades offered in a traditional Indian school. While many of these children will have a lot of learning to make up, there is no doubt that they will succeed, once given the opportunity. Foothills Sports Medicine for their donation of back-to- school supplies for the Dysart District. Foothills partnered with Revive to help to fill the classrooms in the Title 1 schools that Revive currently works hard to keep filled. Thank you for your time and your donation, Foothills! We appreciate you every day!